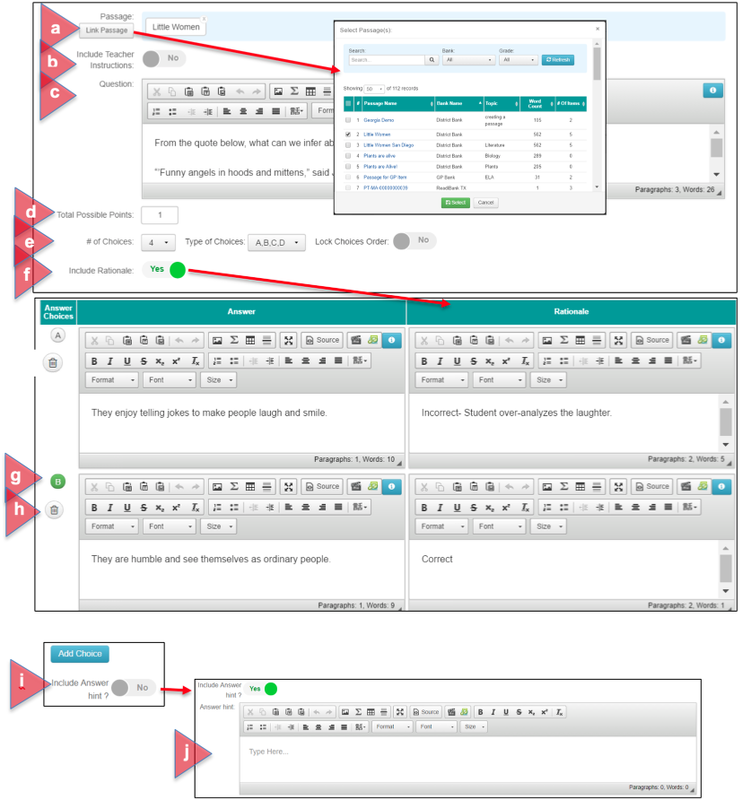 When given appropriate permissions, each SchoolCity SUITE User has the ability to create and publish Items and Passages in one of three Work Spaces: My Work Space, School Work Space, or District Work Space. These Items and Passages can then be used in Item Bank Assessments for online or paper administration. This document will review the process for creating an Item by any level user. 1. From the Top Menu Bar, select Item Banks (1a). Then select the desired Work Space (1b). 2. Create a New Item WITH Auto Item Name Generation: This feature is enabled by the District SchoolCity Suite Administrator in the District Default settings. It applies to all items created in the Work Space. Some parts of the name are required, while other parts are optional and will vary per district. a. Click on Create Item to go to the New Item setup screen. b. New Item process steps will appear at the top of the screen. The step you are currently in will be highlighted in green, while the steps still to be completed will be gray. c. Item Name: This field is disabled with Auto Item Name Generation. The item name will be automatically generated after the Type, Use, Subject, and other required fields such as Grade are entered. e. Use: Select the correct code from the drop down menu. Use codes will vary according to the User level. f. Subject: Select the subject (content area) from the drop down list. g. Grade(s): If a required part of the Auto Name, select the grade(s) for which the item will be used. h. Generate Item Name: Once all required naming fields have been selected, click here to generate the Item Name. After generating the name, this button will disappear. i. Course Group (optional): Select a Course Group, if any have been created in the Group Manager, for which the item will be used. j. Course (optional): Select the Course for which the item will be used. k. Pilot Item: Slide No to Yes if you want to flag this item as a Pilot Item. A Pilot Item will be highlighted in pink in all areas of SchoolCity Suite. When used in an Item Bank assessment, Pilot Items will calculate statistics in the Item Analysis Report, but the item will not contribute to the total possible points on an assessment. b. Item Name: Create a unique name that is specific to the subject, standard(s), grade, and/or connection to a passage. d. Pilot Item: Slide No to Yes if you want to flag this item as a Pilot Item. A Pilot Item will be highlighted in pink in all areas of SchoolCity Suite. When used in an Item Bank assessment, Pilot Items will calculate statistics in the Item Analysis Report, but the item will not contribute to the total possible points on an assessment. e. Subject: Select the subject (content area) from the drop down list. f. Grade(s): Select the grade(s) for which the item will be used. g. Course Group (optional): Select a Course Group, if any have been created in the Group Manager, for which the item will be used. h. Course (optional): Select the Course for which the item will be used. Complete the setup for each Item Type as prompted. An example of each type is shown. Skip to Step 5 to continue the item creation process. Students choose one correct answer from several answer choices. b. Include Teacher Instructions (optional): Slide No to Yes and enter instructions in the text box. d. Total Possible Points: Enter the maximum number of points students may earn on this item. e. Select Number of Choices (2 to 9), Types of Choices (letters or numbers), and Lock Choices Order (Slide No to Yes to prevent the answer choices from being randomized during online testing). f. Include Rationale (optional): Slide No to Yes, and a Rationale column will appear next to each answer choice. A rationale for each answer choice must be entered in the text box in order to save the work. g. Select Correct Answer: Click on the circle in the Answer Choice Column to indicate the correct answer. Leave all other answer choices blank. h. Delete Choice: Click on the trash can icon to delete an answer choice. i. Add Choice: Click here to add an answer choice. j. Include Answer Hint (Multiple Choice only): Slide No to Yes to add a hint. Write the hint in the text box. 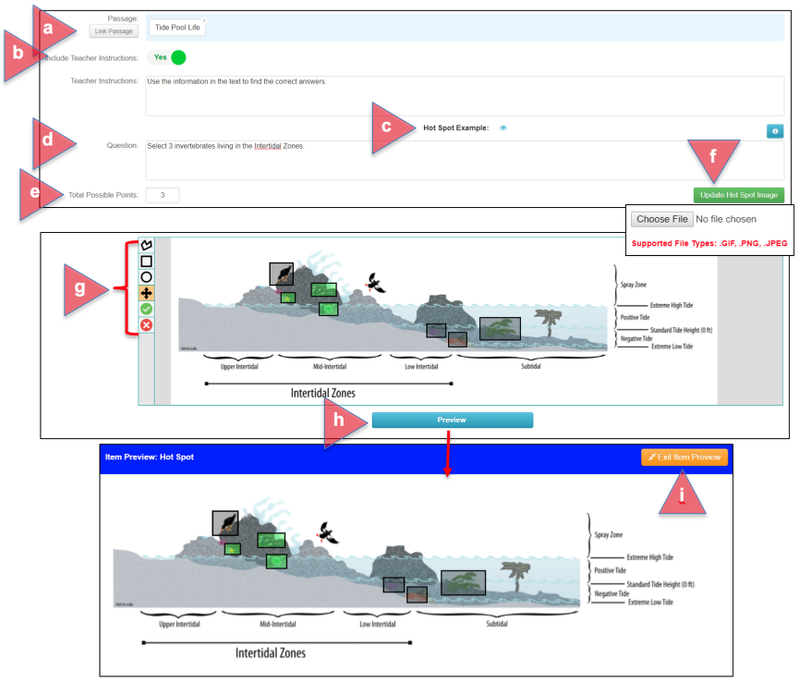 When this property is enabled for online testing, students can see a hint after incorrectly answering an item on the first attempt. Students choose two or more correct answers from several answer choices. Partial credit may be given. Setup is the same as for MC items except for the point value. a. Full/No Credit: Choose Full/No Credit if you want students to earn the full credit only if they choose all of the correct answers. Otherwise the answer will be marked incorrect. b. Partial Credit: Choose Partial Credit if you want to give students credit for choosing one or all correct answers. 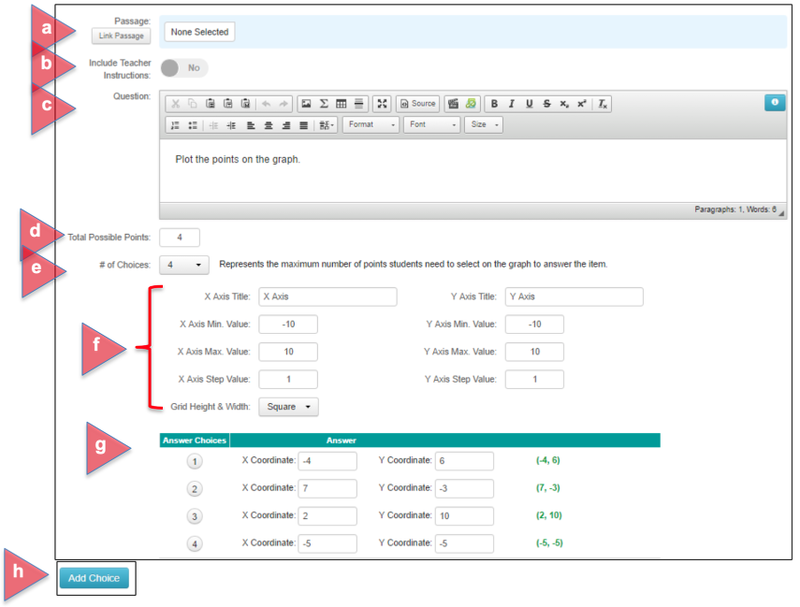 Enter the point value in the Points column to the right of the answer choice. c. Delete Choice: Delete an answer choice by clicking on the trash can icon. d. Add Choice: Add an answer choice. Students write/type a response in the text box that is scored with a rubric. Online CR items are scored using the Score Online process. b. Include Teacher Instructions (optional): Slide No to Yes to add instructions. d. Total Rubric Points: Enter the maximum points possible on the scoring rubric. e. Rubric Score Multiplier: The value entered will be used to determine the Total Possible Points by multiplying the Total Rubric Points by the Rubric Score Multiplier. The Rubric Score Multiplier will default to 1.
f. Total Possible Points: Total Possible Points will be determined based on the Total Rubric Points multiplied by the Rubric Score Multiplier. g. Include Rubric: Slide No to Yes to include an existing rubric. Upload a PDF of a Teacher and/or Student rubric by clicking on the folder icon. The Teacher Rubric is to view while scoring the item. Students may view the Student Rubric while taking the assessment online in the Student Portal. h. Teacher Rubric Name and Rubric AND/OR Student Rubric Name and Rubric: If not uploaded as described above, type the rubrics directly in the text boxes, or use the Copy/Paste options to import text. i. Include Character Limit: Slide No to Yes. Select Characters Remaining or Characters Used. Characters Remaining counts down the remaining characters from the limit. Characters Used counts up to the limit. Enter a positive whole number greater than 0 for the character limit. j. 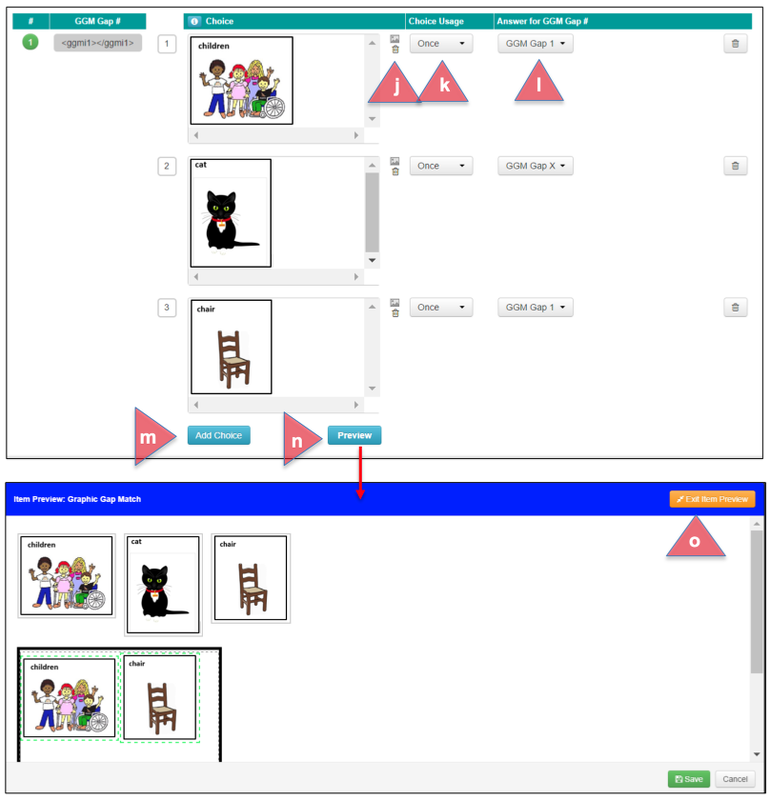 Answer Option - Text and Drawing Tool: When the drawing option is enabled for CR items, students can draw their answer while taking the assessment in the Student Portal. Users can opt to include both Text and the Drawing Tool for students to enter their answer or only one of these options. Please see the Help document, Student Portal: Tools, for more information on the drawing tool. k. Sample Response (optional): Include a sample response, if desired. Type directly in the text box, or use the Copy/Paste options to import text. 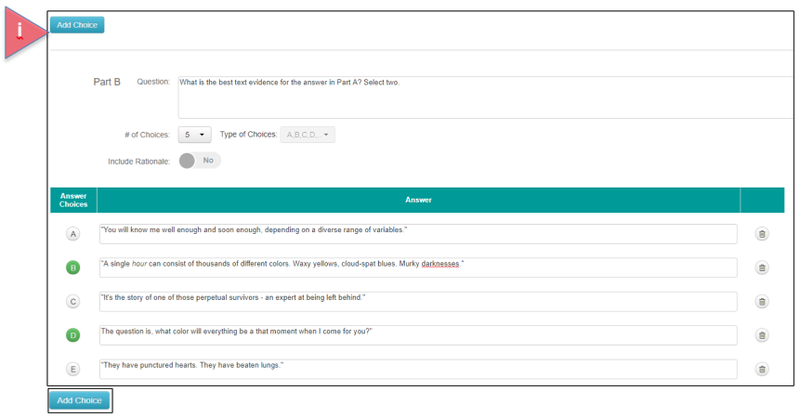 Students will select their response from one or more dropdown menus within the question. No partial credit available. b. Include Teacher Instructions (optional: Slide No to Yes to add instructions. c. Question: Type the question in the text box. The CKEditor will appear with “IC” and “Clear IC”. Note: Place your cursor in the position you wish to have the inline choice within the text. You do not need to add extra spaces or blank lines. The program will do this automatically for you when you select “IC”. You may have more than one IC option. Click on Clear IC to delete. e. Update Inline Choice: Click here to show the inline choice boxes and complete. By default, two options will appear. f. Add Option: Click here to add additional answer choice options. g. Select Correct Answer: Click on the radio button next to the correct answer. 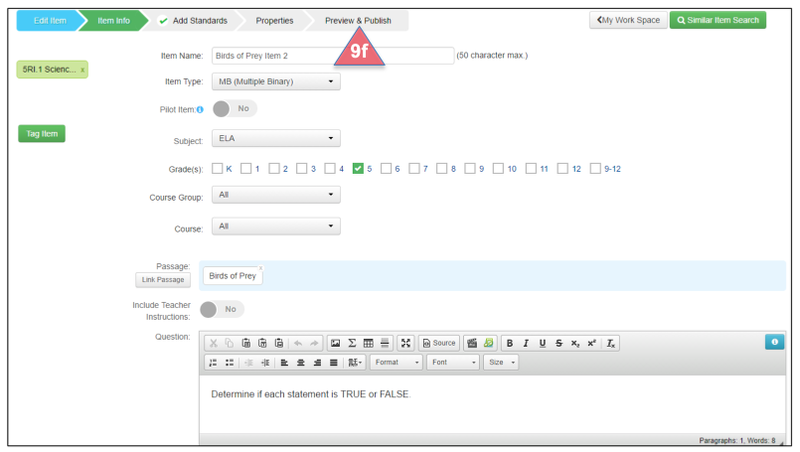 h. Preview: View how the item will display in the Student Portal. i. Exit Item Preview: Click here to close the window and continue. Students place several answer choices in the correct order. No partial credit available. b. Include Teacher Instructions: (optional) Slide No to Yes to add instructions. e. Sample Response (not necessary for this item type). f. Select Number of Choices (2 to 9), Types of Choices (letters or numbers), and Lock Choices Order (Slide No to Yes to prevent the answer choices from being randomized during online testing). g. Include Rationale: (optional): Slide No to Yes, and the Rationale column will appear next to each answer choice. A rationale for each answer choice must be entered in the text box in order to save the work. h. Item Correct Order: Use the horizontal arrows to put the answer choices in the correct order. i. 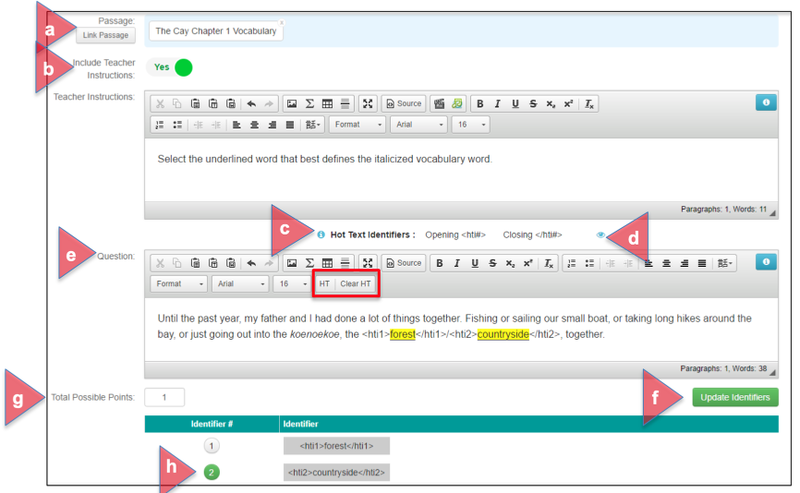 Answer Choices: Type each answer choice in the text boxes, or use the Copy/Paste options to import text. 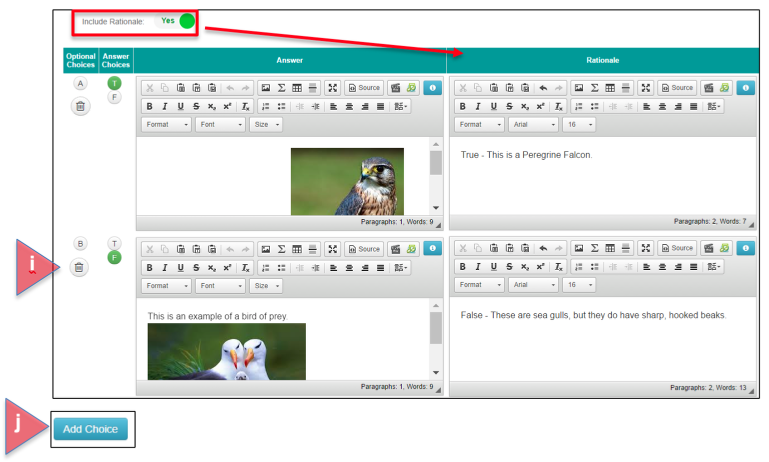 May also include audio, video, images, equation, or table as shown in the CKEditor formatting tools. k. Add Choice: Add an answer choice. Students determine if answer choices are either True/False, Yes/No, or Correct/Incorrect. No partial credit available. c. Question: Type the assessment question in the text box. May also include audio, video, images, equation, or table as shown in the CKEditor formatting tools. f. Select Number of Choices (2 to 6), Types of Choices (T/F, Y/N, C/I), Optional Choices (letters or numbers), and Lock Choices Order (Slide No to Yes to prevent the answer choices from being randomized during online testing). g. Include Rationale (optional): Slide No to Yes, and the Rationale column will appear next to each answer choice. A rationale for each answer choice must be entered in the text box in order to save the work. h. Optional Choices and Answer Choices: Optional Choices are the answer options for the question. Answer Choices are the statements of True/False, Yes/No, or Correct/Incorrect for each option. j. Add Choice: Add an answer choice. Students enter the answer to a numeric question on a keypad (online), or bubble the answer on a griddable template (on paper). e. Include Griddable: If administering on paper, slide No to Yes to attach a griddable template from those made available by the district. Students bubble in the answer on the answer sheet. f. Answer: Enter the correct answer to the question. g. Tolerance (optional): Enter a tolerance value, if needed. 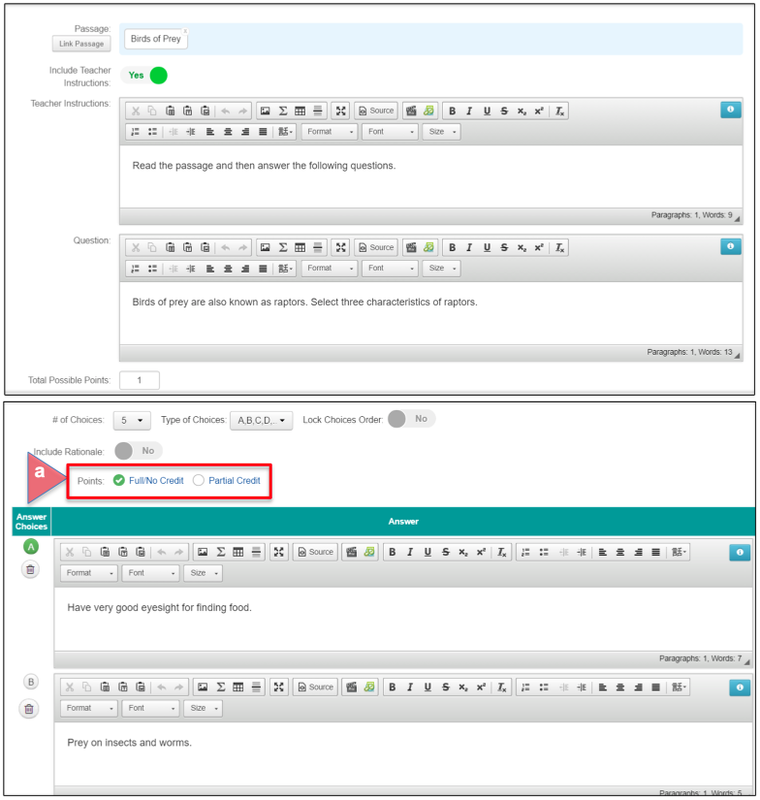 Students click and drag answer choices into or next to the correct response box. No partial credit available. c. Gap Match Identifiers: Hover over the i icon to view the directions. d. Gap Match Example: Click on the eye icon to view a GM example. e. Question: Enter the question using the GM button in the CKEditor to add a gap. Use Clear GM to delete a gap. f. Update Gaps and Choices: Click here to create the gaps. g. Total Possible Points: Enter the maximum number of points students may earn on this item. h. Complete the table: Gap #, Gap (from Question), Choice (list answer choices in random order), Choice Usage (Once or Multiple), Answer for Gap # (select the correct answer). Use the trash can icon to delete a choice. i. Add Choice: Add another gap choice if needed. j. 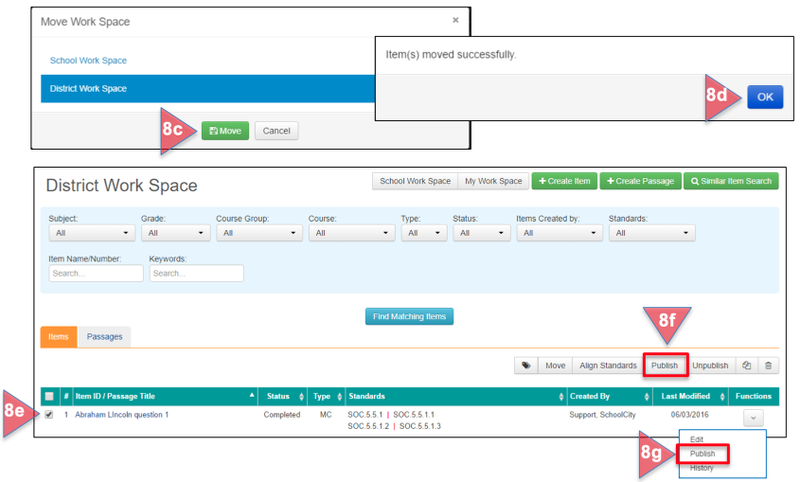 Preview: View how the item will display in the Student Portal. k. Exit Item Preview: Click here to close the window and continue. 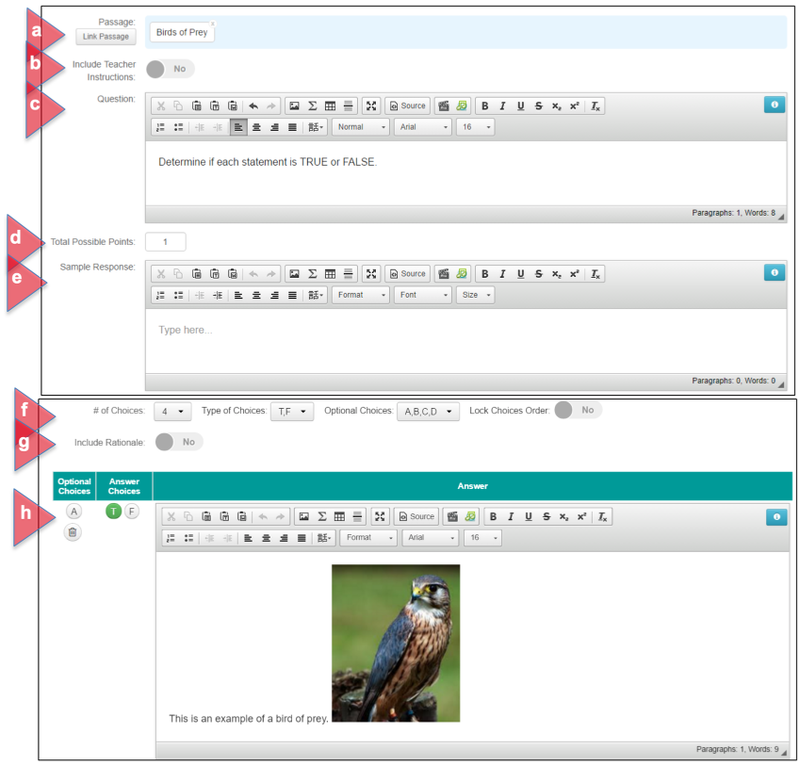 Students click and drag images into or next to the response box, table, chart, or other graphic. No partial credit available. c. Question: Enter the question students will read. 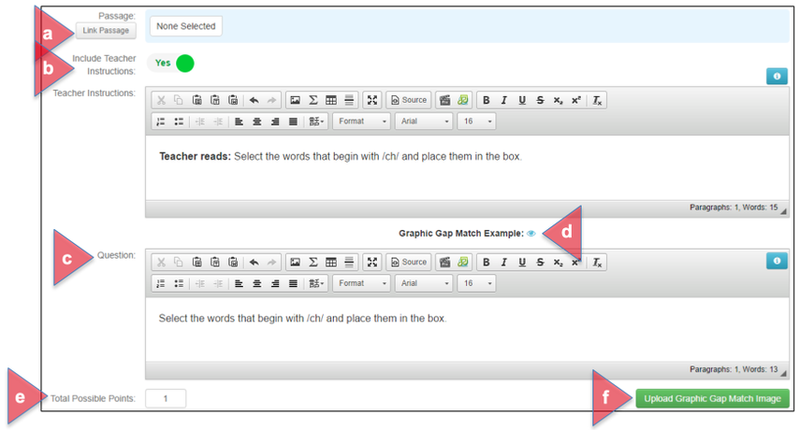 d. Graphic Gap Match Example: Click on the eye icon to view a GGM example. e. Total Possible Points: Enter the maximum number of points students may earn on this item. f. Upload Graphic Gap Match Image: Click here to upload the box, chart, or other graphic where students will drag and drop their answer choices. g. Choose File: Click to choose the correct file. Note the acceptable file types - .GIF, .PNG, .JPEG. h. Upload: Click to upload graphic. i. Create Gap: Click inside the image to create the gap(s) where students will drag and drop answer choices. The GGM Gap # chart below will automatically populate. j. Add an answer choice image: Click on the image icon to choose a file and upload. Click on the trash can icon to delete an image. k. Choice Usage: Select Once or Multiple, meaning the answer choice can be used only once or multiple times. 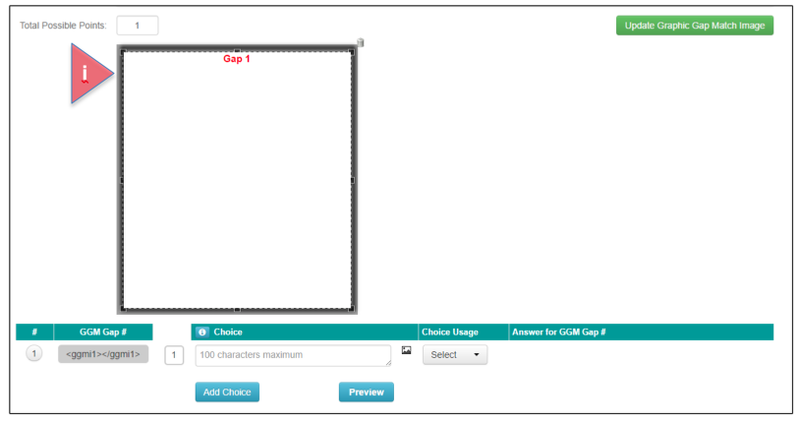 l. Answer for GGM Gap #: Select the Gap # for which the image is the correct answer. m. Add Choice: Click to add another answer choice. 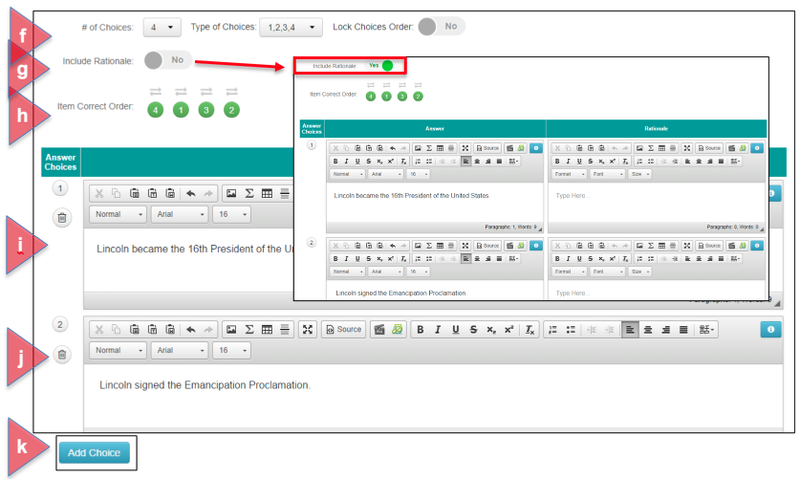 n. Preview: View how the item will display in the Student Portal. o. Exit Item Preview: Click here to close the window and continue. Students select underlined words, phrases, or sentences within a given text to answer the question. No partial credit available. c. Hot Text Identifiers: Hover over the i icon to view instructions. d. Hot Text Example: Click on the eye icon to view a HT example. e. Question: Type the question using the HT button in the CKEditor to insert the answer choice where it should be in the text. Use Clear HT to delete. f. Update Identifiers: Click here to show answer choices. The answer choices show in yellow highlighting in the question. g. Total Points Possible: Enter the maximum number of points students may earn on this item. h. Select correct answer: Click on the radio button next to the correct answer. Students select one or more hot spots on the image to answer the question. When students click on the hot spots, their selections are shown with a light green background in the Student Portal. No partial credit available. c. Hot Spot Example: Click on the eye icon to view an example of a HS item. d. Question: Enter the question in the text box. f. Upload Hot Spot Image: Click to upload an image from your desk top. A new window will open that will allow you to upload the appropriate image (.GIF, .PNG, or .JPEG format), then click on Upload. You may change or update your image by clicking on “Update Hot Spot Image” again. g. Tools: Use the tools to select where the hot spots would be. You can use a circle, a rectangle or a free form to select your hot spot area. Use the Icon that looks like a cross to change or move your hot spot selection. Use the green check mark to select a correct answer. Use the red x to mark an incorrect answer. 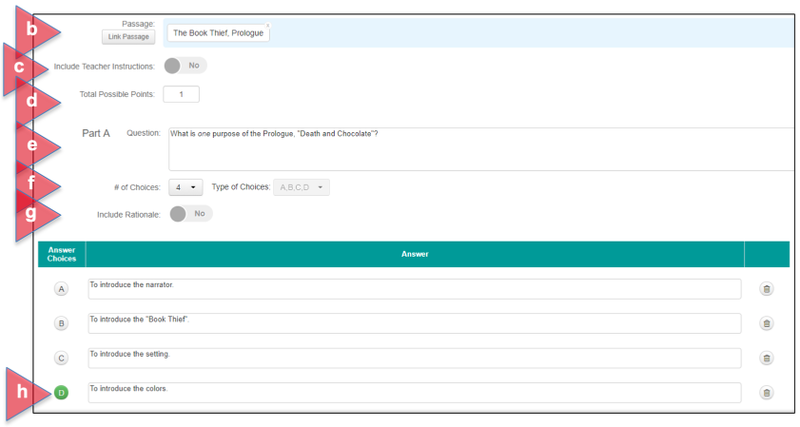 h. Preview: View how the item will display in the Student Portal with correct answers. Students select answers to a 2-part question. Part A and B can be a combination of Multiple Choice or Multiple Response. No partial credit available. a. Select ItemType: Once EBSR is selected as the Item Type, select either MC or MR for both Part A and Part B of the question. c. Include Teacher Instructions (optional): Slide No to Yes to add instructions. e. Question: Enter the question in the text box. Repeat for Part B.
f. Number of Choices (2 to 9), Types of Choices (letters or numbers): Select the number of choices and types of choices. Repeat for Part B.
g. Include Rationale (optional): Slide No to Yes, and a Rationale column will appear next to each answer choice. A rationale for each answer choice must be entered in the text box in order to save the work. h. Select Correct Answer: After completing the answer choices, click on the circle(s) in the Answer Choice Column to indicate the correct answer. Leave all other answer choices blank. Use the trashcan icon to delete an answer choice. Repeat for Part B.
i. Add Choice: Add an answer choice. Students enter an exact answer to a question. c. Question: Type the assessment question in the text box using the XCR button in the CKEditor to insert the answer option(s). e. Update Options: Click here to generate the answer option below. f. XCR Option(s): Enter the correct answer(s). g. Add Student Response: Click here to add other acceptable answers. 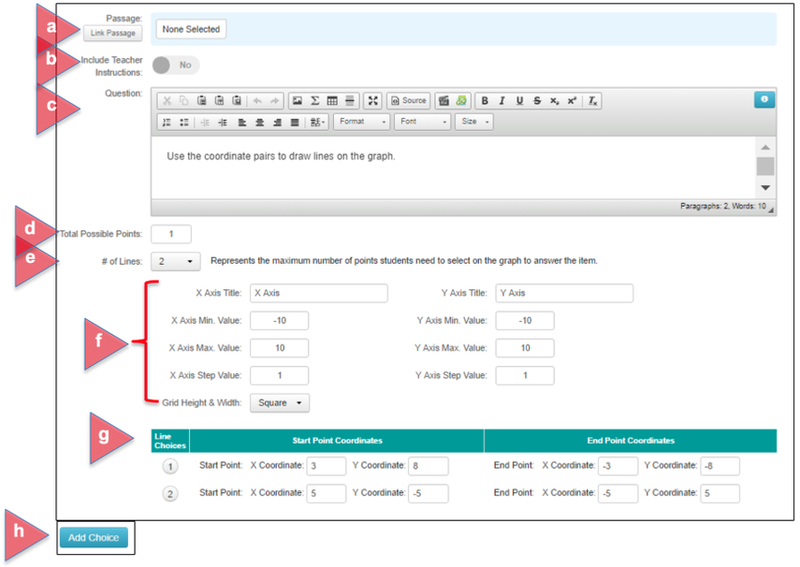 h. Preview: View how the item will display in the Student Portal with correct answer. Students plot a maximum of 9 points on a graph using information in the problem. No partial credit available. e. Number of Choices (1-9): Determine the number of points the students will plot on the graph. f. Define the Parameters of the Graph: Complete all fields to build the desired graph. g. Answer Choices and Answers: Enter the correct answers. h. Add Choice: Add an answer choice. Students draw a maximum of 9 line segments on a graph using information in the problem. No partial credit available. e. Number of Choices (1-9): Determine the number of lines the students will draw on the graph. g. Line Choices, Start Point Coordinates, and End Point Coordinates: Enter the desired information. Students are provided a prompt to which they must provide a written response. The student is awarded points based on objective categories. c. Question: Enter the writing prompt. d. # of Objectives: Select the number of objectives the prompt will be scored with (1-20), then click Update. e. Objective Name: Enter the name of each objective. f. Objective Point Range: Enter a minimum and maximum point value for each objective. g. Total Points Possible: The total points are automatically calculated depending on the max points associated with each objective. h. Delete: Delete an objective. i. Non-numeric Value: If the numeric value is set at 0, then the value can be replaced with NS or NA. j. Include Standards for Objectives: Slide No to Yes to add a Standards step in the creation process. k. Include Rubric: Slide No to Yes to include a Scoring Rubric. l. Rubric (optional): Upload PDFs of Teacher/Student Rubrics. 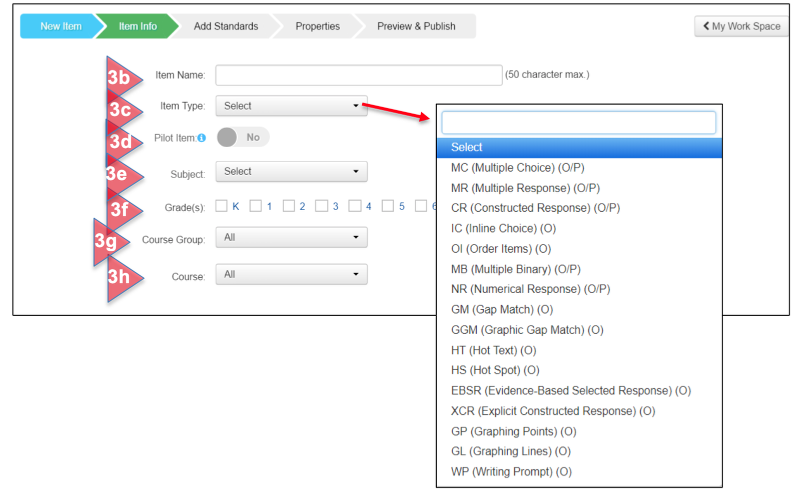 m. Teacher/Student Rubric Name (optional): If a rubrics are not uploaded, then each can be named and entered in the text boxes. n. Sample Response (optional): Include a sample student response. a. No Standards Selected or Not Aligned: Select one of these options to skip standards alignment. 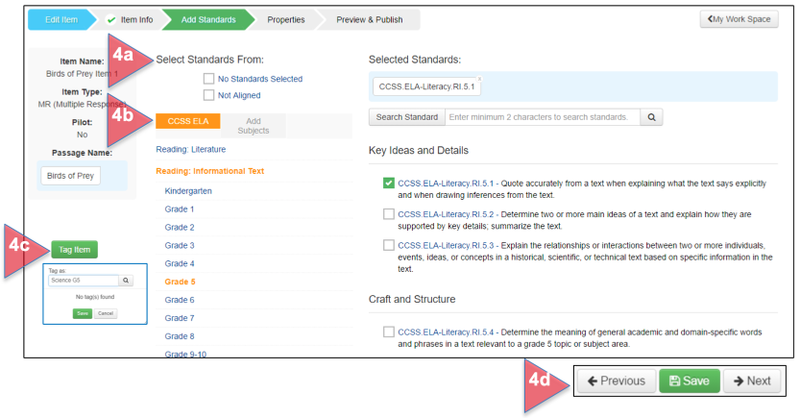 1) For ELA standards, select the desired strand, then grade. The standards will appear on the right. Check the open box next to the standards that align with the item. 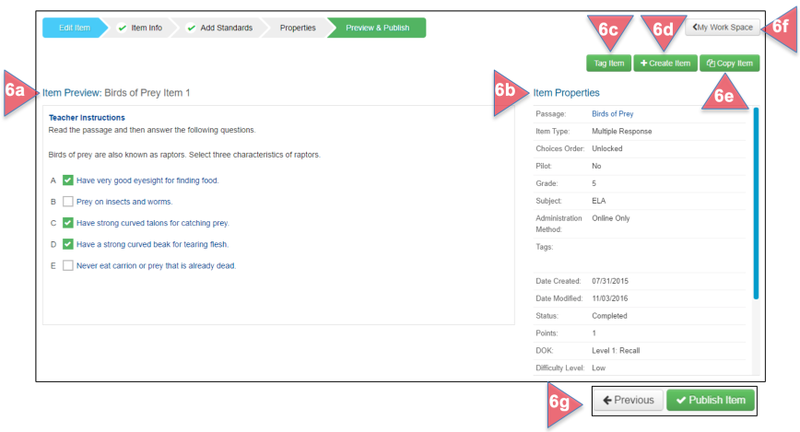 2) For Math and all other subjects, select the grade first, domain, and then standard(s). 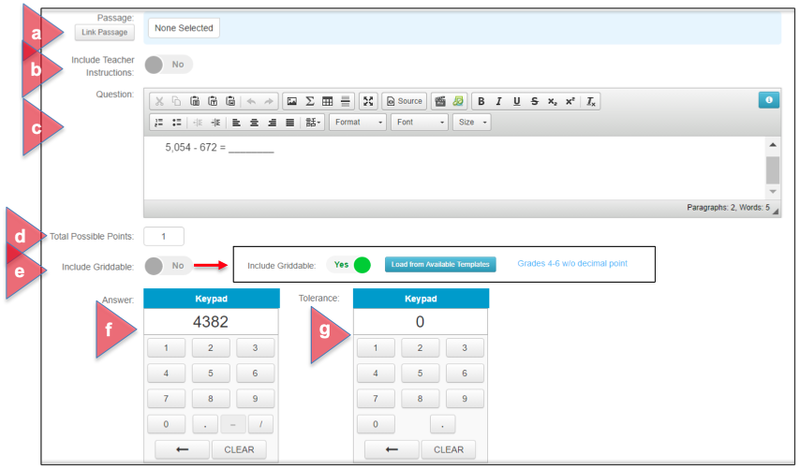 c. Tag Item (optional): Select a tag for the item for easier search capability in the Work Space. d.Previous/Save/Next: Click on Previous to return to the previous step, Save to save your work for later, or Next to move to the next step in the setup process. a. Administration Method: Determine how the item will be administered. b. Online Tools (optional): Select any online tools that students may use to answer this item. c. Bloom’s Taxonomy: Select the appropriate level or N/A. d. Depth of Knowledge: Select the appropriate level or N/A. e. Difficulty Level: Select the appropriate level or N/A/. f. Point Bi-Serial Number (optional): Measures reliability of item. Enter value if known, or leave blank. g. P-Value (optional): Calculated probability. Enter value if known, or leave blank. h. Tag Item (optional): If not done previously, tag the item for easier search capability in the Work Space. i. Previous/Save/Next: Click on Previous to return to the previous step, Save to save your work for later, or Next to move to the next step in the setup process. a. Item Preview: Preview the item and determine if any edits or revisions need to be made. b. Item Properties: Preview the item properties and determine if any edits or revisions need to be made. c. Tag Item (optional): If not done previously, the item may be tagged here. d. Create Item: Create a new item from this window. e. Copy Item: Click here to make a copy of this item. The copy must be named first before editing and publishing it. f. Return to My Work Space: Click here to return to the Work Space where all items and passages are listed. g. Previous/Publish Item: Click on Previous to return to the previous step, or Publish Item if it is complete and ready to use. h. If Publish Item is selected, a message appears verifying that action. 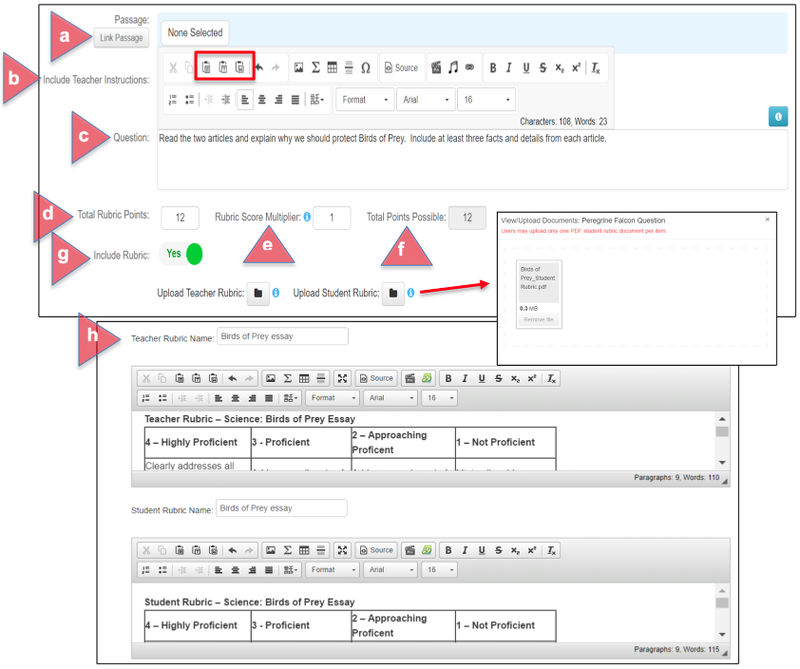 Select the desired Work Space where the item should be published, and then click on Publish. i. A second message confirming this action will appear. Click OK to continue. 7. The Work Space: Return to the Work Space to view the list of items and passages. a. Search filters: Use the search boxes to find specific items in the Work Space. Click on Find Matching Items to view results. c. Item Details: Item ID/Passage Title (Item linked to a Passage), Status (In Progress, Completed, Published), Type, Standards, Last Modified, and Functions (depend on status). d. Bulk Functions: Tag Item, Move (See Step 9), Align Standards, Publish, Unpublish, Copy, Delete. Select one or more items by checking the open box in the far left column, then selecting the desired action. 8. Moving an Item from My Work Space to the School or District Work Space for Publishing: With permission, you may be able to work in a School or District Work Space. a. Find your completed Item in the Work Space and check the open box next to the passage name. c. Select the desired location and click Move. d. A message confirming this action will appear. Click OK to continue. e. To Publish the Passage, find the Passage in the selected Work Space. Check the open box next to the Passage Name. g. Or, click on the down arrow in the Functions column and select Publish. 9. Edit an Item: A Published Item must be unpublished first before it can be edited. a. To Unpublish the Item, find the Item in the selected Work Space. Check the open box next to the Item Name. c. Or, click on the down arrow in the Functions column and select Unpublish. d. A message will appear confirming this action. Click OK, then click OK again in the second message. 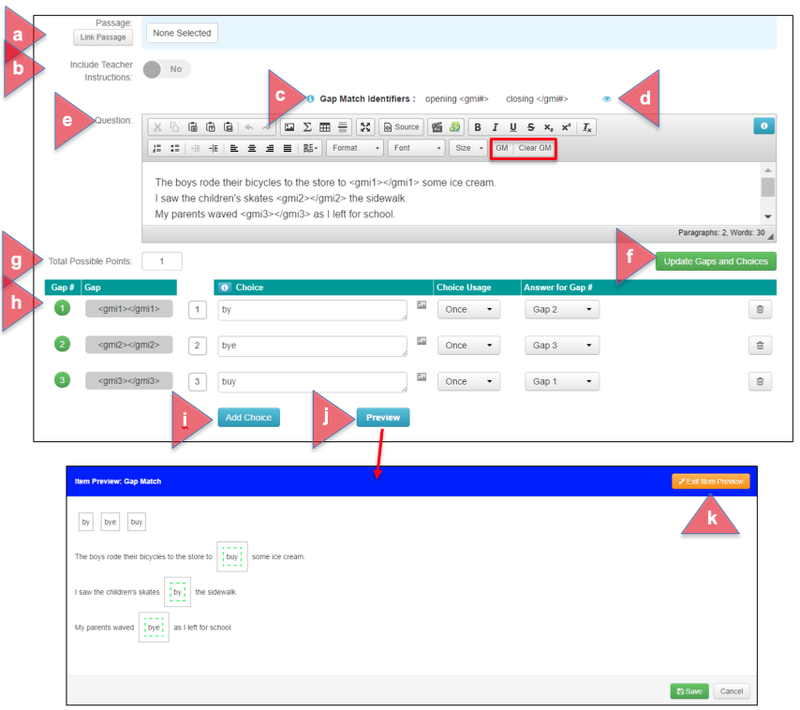 e. To return to setup to make edits, find the Item in the Work Space, then click on the drop down arrow in the Functions column. Select Edit. f. Make edits as needed, and follow the steps to publishing the Item in the correct Work Space, as outlined above.